The photo that has been circulating on social media. 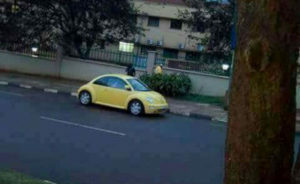 Abiriga confirmed that was indeed him shown answering nature’s call with bodyguard standing next to his “yellow” car. Courtesy photo. KAMPALA – The City Hall Court has summoned Arua Municipality MP Ibrahim Abiriga to answer charges of being a public nuisance. The beleaguered MP is expected to appear in court on October 6. Public nuisance is a class of common law offence in which the injury, loss or damage is suffered by the local community. The MP was on Monday evening photographed urinating along a city street that houses the offices of the Finance ministry. The photos spread like bushfire on Tuesday, and the MP while appearing on a local television station, confirmed he had indeed been forced to answer nature’s call on the street side because he could was unable to hold on until he accessed washrooms. The City Hall Court summons now indicate that the MP broke the Kampala Capital City Authority (KCCA) health rules. The criminal summons were issued by Grade one magistrate Beatrice Khainza. MP Abiriga confirmed it was him, adding that he was badly off and he is ready to pay the fine. Courtesy photo. “I am in advanced age, what did you want me to do? I was badly off. I am ready to pay the fine,” he said. Mr Abiriga, seen among the public as a comical figure, is no stranger to controversy. 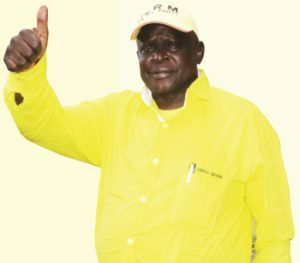 The Arua municipality legislator is among the NRM legislators who initiated the move to lift the Presidential age limit. He is obsessed with the yellow colour. He wears only yellow attires and shoes.